Temperature : Max. 37°C and Min. 30°C in Summer. Max. 30°C and Min. 25°C in Winter. Best Season : Preferably October to March. One of the most scared towns in India is at the extreme Southern-Eastern limit of the Indian Peninsula, which is well known for its temple corridors-the longest in India, the bathing ghat, Ganthamathana Parvathan,Kothandaramar Temple, Kurusadai and other nearby island, abundant with coral reefs and other marine wonders. 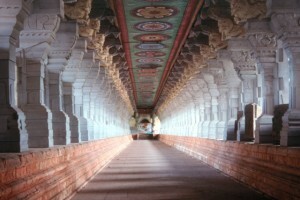 Rameshwaran Temple is renowned for its many pillared corridors 1,220 mts. in length. Air: Nearest airport is Madurai is 167 km. Rail: Rameshwaram is directly connected by rail with Kollam, Madurai, Coimbatore, Tiruchirappalli, Chidambaran, etc. Road: Rameshwaram is connected by regular bus services to Chennai, Knayakumari, Thanjavur, Madurai, Ramanathpuram, Titicorin, etc. This entry was posted in Rameshwaram, Tamil Nadu and tagged Holy Place. Bookmark the permalink.